"Raises max MP by 2, and significantly enhances magic and summon power." Speak to Merlin after acquiring all seven first-level magic spells. 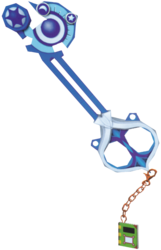 The Spellbinder is a Keychain for Sora's Keyblade which appears in Kingdom Hearts and Kingdom Hearts Chain of Memories. In Kingdom Hearts Chain of Memories, the Spellbinder is the signature Attack Card for 100 Acre Wood, but must be obtained as a reward before it will appear randomly. In Kingdom Hearts Chain of Memories, Owl gives Sora the Spellbinder once he is found, and in Kingdom Hearts Re:Chain of Memories, it is found in a chest at Tigger's Playground. After obtaining each of the seven spells, Sora boasts that his magic is as good as Donald's, and Goofy suggests that he talk to Merlin. Merlin rewards Sora's progress with the Spellbinder. The Spellbinder takes its theme from the imagery of magic and astrology. The handle is dark blue and the guard encircles the handle like a white, squat teardrop where the top of the guard is a white heart. There are two dark blue arches with a hole in the center of each, one on each side of the top of the guard. The shaft consists of two separate blue poles that end at the “teeth” that resembles half of a gear. There is a dark blue circle, surrounded by a light blue, then another dark blue circle around that which is the inside of the teeth piece; this group of circles is attached to the shaft by another light blue arc. The outer side of the circles is a half circle with a point at the peak and two small spheres within the half circle, one by the peak and one in the center of the arc. The top of the shaft is a dark blue, six-pointed star within a light blue circle. Its Keychain has a gold lobster clasp with a rusty chain attached and a green spellbook as the token. The Spellbinder's English name references its method of obtainment by learning all seven spells, as well as the Keychain token. The Japanese name, "Examination," alludes to Merlin's role as Sora's mentor. This page was last edited on 5 April 2019, at 14:35.